The Intra-European Economy parcel shipments are those delivered within the EU within 2-5 business days. It said transit times would improve on approximately 40 per cent of the European lanes in the countries where the service improvement is implemented. 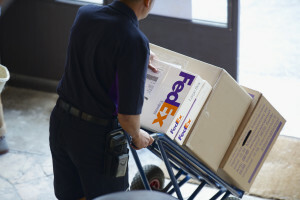 “This is an exciting development for our customers and our team members, as the benefits of integration are coming to life through a faster, more comprehensive service for businesses trading within Europe,” said Bert Nappier, president of FedEx Express and CEO of TNT. TNT’s road network operates 55,000 weekly road trips, across more than 540 depots and 45 countries in Europe. Prior to the acquisition, Europe FedEx already served 46 airports across the continent, and operated more than 39 aircraft and more than 5,000 vehicles on the road.